Unified NuClient: Simply login management server on NuClient to configure, live view or query video from all servers on the system. Support identical, full featured software client application and web client by browser. 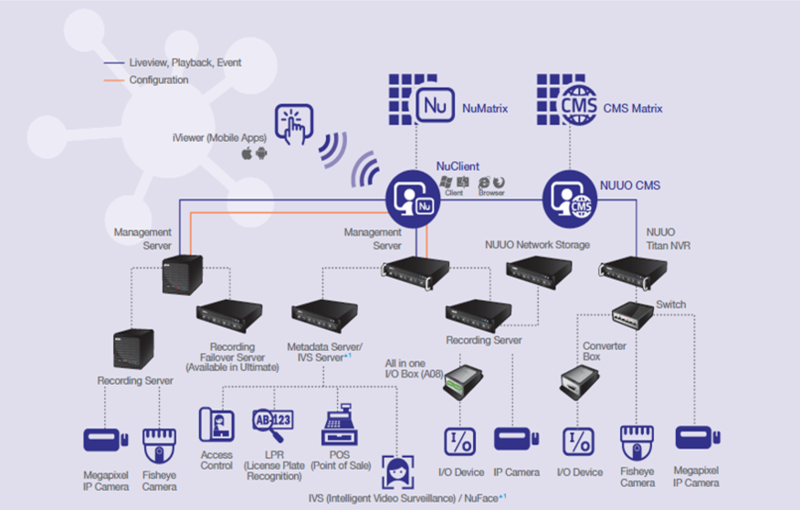 Video Wall (NuMatrix): Support unlimited number of Video Walls and video displays, with up to 100CH display per monitor. Easily drag and drop view and cameras to Video Wall (available in Enterprise). Unlimited Channels monitoring: The system support unlimited client connection and unlimited live viewing/ playback display. It manages up to 400 channels live view and 100 channels playback simultaneously per view. NUUO Image Fusion Technology: Manipulating camera views by changing its viewing angle and image size, making viewing easier in both live view and playback. Moreover, users can stitch multiple cameras together to form a unified single view. Customized Layout: Intuitive layout customization to meet needs for panorama cameras and camera corridor mode. Centralized I/O Management: Manage all I/O devices on one I/O panel. Control I/O for event detection, instant action and digital output. Centralized Event Management: View and search all event on one event panel. Video will popup by double clicking the event. View Management: Including View group, View tour and Matrix profile, NUUO Crystal™ supports public view for all users and private view for each user. It also supports View Tour to loop through different selected Views. • PTZ/Preset/Patrol control privilege and priority by device. • Support digital PTZ. Easily monitor one camera on multiple grid with different zone to enlarge the usability of megapixel cameras. • Event trigger camera goes to specific preset point. • Support Immervision and VIVOTEK Fisheye. Instant Playback: User can view instantly play the last few minutes of video via double click event, E-Map notification, or video tool bar. The intuitive GUI enable users easily export instant playback video or sync to Playback. Multi-View: NUUO Crystal™ can duplicate the same live view video onto multiple channels and digitally zoom in to see the details of different spots on cloned channels without losing the original live view video. • Generic dewarp technology to process all type of fisheye-warp video. • Client display supports 4 modes: Original mode, PTZ mode, Quad mode and Perimeter mode. Fisheye Dewarp: Generic dewarp technology to process all type of fisheye-warp video. It supports Original mode, PTZ mode, Quad mode and Perimeter mode. Snapshot: Easily take snapshot in BMP/JPEG during live viewing or playback. User can also take snapshot for whole View. Centralized E-Map: Tree structured E-Map with unlimited map layers. Supports intuitive GUI indicators of cameras, I/O devices, POS, Access Control and all server locations to have real-time system monitor. Supports notification on indicator when event happened, double click popup live video and instant playback, drag and drop cameras from map into live view, and one click exam device property. Auto-switch stream profile: Automatically switch stream profile base on the grid layout to fulfill both need of best quality of viewing and the loading of client computer. Intuitive interface: Browse video with GUI timeline and intuitive interface of playback, reverse playback, skip forward/backward, speed up/down, and play by speed shuttle. Intelligent Search: Intuitive post-event motion search for suspicious areas on video and post-event 3rd party data keyword search then query related camera recording. The system can also search events and double clicking query associated recording to quickly figure out flagged events. Evidence Export: Export video or third party device data in MOV and print video image in BMP/ JPEG. Backup: Support automatically backup videos to FTP and manually backup video from any recording servers. Thumbnail: When users check on thumbnail, they can move to thumbnail time directly. And when users double check on it, they can move to time line and zoom in.